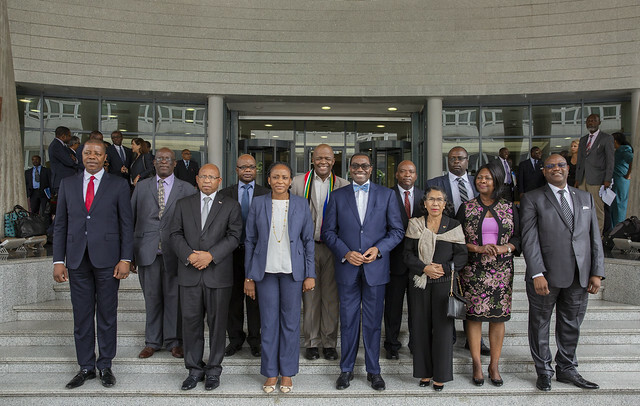 The Southern African Governors of the African Development Bank have described the Bank as the future of Africa’s development, and called on it to lead the way to faster-paced development of the continent. The Governors – Finance Ministers and Ministers of Economic Planning from Angola, Lesotho, Madagascar, Malawi, Mozambique, Namibia, São Tomé and Príncipe, South Africa, Swaziland, Zambia and Zimbabwe – shared their thoughts at a regional consultation with African Development Bank President Akinwumi Adesina and Senior Bank Executives at the institution’s headquarters in Abidjan, Côte d’Ivoire. “I thank the Bank for accelerating lending,” said Moeketsi Majoro, the Minister of Finance from Lesotho. He commended the Bank’s decentralization policy for bringing the institution closer to its shareholders. In 2017, the Bank accelerated the scale and delivery of its lending and achieved the highest disbursement ever in the history of the Bank, with over $7.2 billion. “It is clear to me today that the continent has a new and exciting sense of purpose as exhibited by the African Development Bank. The Bank is the future of African development, transformation, and respect,” said Mondli Gungubele, Alternate Governor and Deputy Minister of Finance for South Africa. “I would like to join the chorus of Governors who have expressed appreciation for how the African Development Bank is being run and for its strong adherence to core principles of good governance,” Gungubele said. “We strongly feel the increase of the Bank’s operations as well as its greater involvement in our country. The Bank came to our assistance when we most needed it. We feel its impact in the public and private sectors,” said Aia-Eza da Silva, the State Secretary of Budget and Public Investment, on behalf of the Governor from Angola. She called for the Bank’s assistance to enable the country to deliver on project implementation faster. Speaking further, President Adesina called for collective action on scaled-up implementation of Africa’s development, noting that a faster-paced development and development with pride is what the continent needs. He assured that all the countries of the Southern region have a great opportunity to accelerate inclusive growth in the next few years and that the African Development Bank would be with them on this journey. The Minister of Finance and Budget of Madagascar, Vonintsalama Andriambololona, noted that the many challenges faced by Africa require that the continent sits up in order to develop and to grow. She commended the Bank’s leadership in reducing time lags between project conception and first disbursements, which she noted was faster with the African Development Bank than with any other multilateral development institution. “We are grateful to the African Development Bank for anticipating Africa’s funding needs and addressing them now. Africa needs more resources to grow. As such, we are favourable to a capital increase for the Bank to help it address Africa’s funding needs,” Andriambololona said. The Governors expressed concern about the Southern African region’s low growth performance in 2017 and the fact that nine out of 10 developing countries will be in Africa by 2030. They identified the Bank as Africa’s trusted partner to lead the way to reverse the situation. Despite a positive outlook, Southern Africa is facing serious economic challenges, the Southern Africa Regional Economic Outlook released by the Bank has revealed. The analysis presented to the Governors indicates that, like the rest of Africa, the region faces severe job deficits and challenging demographics. The Governors lauded the Bank’s support in their countries and observed that a General Capital Increase would enable it to play a more effective role in fast-tracking Africa’s economic development, moving from billions to trillions. According to data provided at the meeting, Bank operations are transforming the lives of millions of Africans. According to figures for 2010-2017, 18 million Africans benefitted from new electricity connections and 57 million Africans benefitted from improvements in agriculture. In the same period, 420,000 small businesses were provided with financial services, while 83 million Africans benefitted from improved access to transport and 49 million Africans benefitted from better access to water and sanitation. The region’s growth projections for 2018 and 2019 are 2.0% and 2.4%, respectively, which are still insufficient for poverty reduction. The region produces 20% of Africa’s GDP and houses 16% of the population. The Minister of Agriculture from Swaziland, Moses Vilakati, flagged two major concerns – climate change and the fact that by 2025, half of Africa’s youth are projected to be unemployed. “We certainly need the Bank’s High 5 development priorities. We also need to increase domestic resource mobilization,” he said. The Bank’s current portfolio in Southern Africa stands at US $8.3 billion in 201 projects, said Josephine Ngure, the Bank’s Deputy Director General for the Southern Africa region. “Like other African countries, there is an urgent need for structural transformation to accelerate economic diversification in the Southern Africa region,” said Célestin Monga, the Bank’s Chief Economist and Vice-President, Economic Governance and Knowledge Management. Botswana (4.3%), Madagascar (4.1%), Mozambique (4.3%), and Zambia (3.8%) led growth in 2016-2017, but South Africa, the region’s economic powerhouse, performed below potential. Significant resources are required for the region’s development and are estimated to be approximately US $7 billion per annum at the country level and US $70 billion for the Southern African Development Community regional programmes and projects. Additional resources have helped Africa effectively respond to the financial and economic crisis and increased demand for the Bank’s resources in an evolving environment, said Hassatou Diop N’Sele, Acting Vice-President for Finance at the Bank, stressing that a stronger African Development Fund is needed to position the Bank as the leading arranger of Africa’s syndicated co-financing. The Governors were optimistic that the inaugural Africa Investment Forum (scheduled for November 7-9, 2018 in Johannesburg, South Africa), would strategically leverage investments in Africa and scale up project preparation facilities and tools. To facilitate the Bank’s closer relationship with Lusophone countries, President Adesina disclosed that the Bank had scheduled a meeting with a delegation from Portugal, including Portugal’s Secretary of State, to discuss key issues including the acquistion of the Portuguese language by Bank staff and de-risking tools for Lusophone countries. The Governors’ consultation on Africa’s development challenges and the Bank’s reforms is the fifth of five regional meetings involving all 54 regional member countries of the institution.